As I said in the last post I was a little unhappy with the colour of these structures. So I decided to give them a dry brush with some grey to tone them down a bit. Here is the end result. 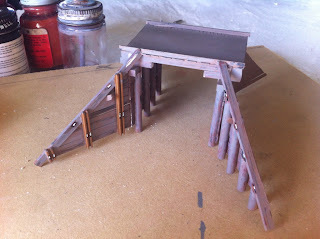 I think the bridge looks a little more weathered in the timber now. The yards now look no where near as dark as they were in the last post. Something extra, these cattle grids were measured at "Bungulla" and made from styrene. This won't be their final location, it was just a good spot for a photo. Dark brown is more realistic than purple. 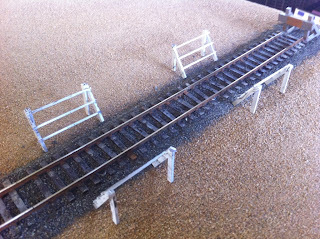 For how long have you been constructing your model train layouts? Sorry for the late reply Larry. This layout has been under construction for about 12 months now. 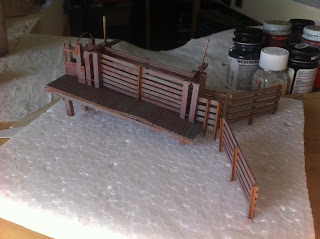 As for the scratch building, about the same time.